GBA Super Mario Advance 2: Super Mario World (USA) "warps" in 10:07.98 by Masterjun. 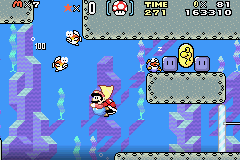 Super Mario Advance 2 is the port of Super Mario World to the Game Boy Advance. While similar to the original game in many respects, there are some subtle differences that matter for tool-assisted runs. A detailed rundown of tricks and level by level commentary can be found in the author's comments.